The 36th issue of The Horseman’s Gazette is about to be released. Wait…what is The Horseman’s Gazette? You haven’t heard? 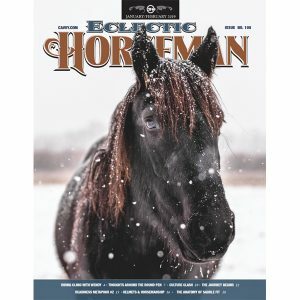 No, it’s not a printed publication; it’s an ongoing DVD video series focusing on the same practical, unembellished, and outstanding horsemanship, and presented by many of the same trusted horse folk, you find in Eclectic Horseman magazine. From Buck Brannaman to Wendy Murdoch, Bryan Neubert to Martin Black…Ellen Eckstein, Lee Smith, Joe Wolter, Buster McLaury, and on and on—you won’t find a larger more comprehensive collection of video insights and lessons from a wider range of professionals anywhere. 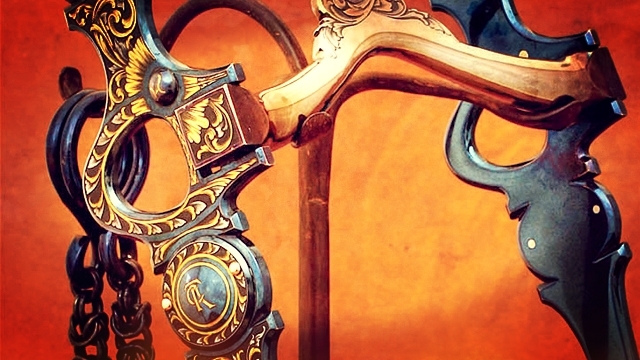 And, this distinctive horsemanship video encyclopedia just keeps growing. It is called the Gazette because it is published four times a year and annual subscriptions can be purchased so they arrive regularly in your mailbox just like copies of your favorite periodical. Individual issues also can be ordered from the backlist. 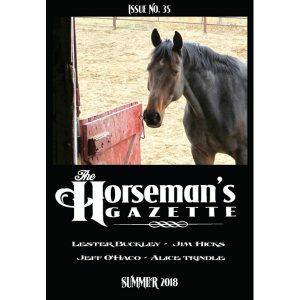 This year marks the ninth that the Gazette has been produced by Eclectic Horseman magazine. The idea for this unique video spin-off from the magazine was the idea of Eclectic Horseman owner and editor, Emily Kitching. Emily edited and re-worked that first video project to get it right, but it left her thinking that she might be better suited to take on both the editing and the video work in the field. Emily describes The Horseman’s Gazette as “a quarterly educational DVD series.” Whenever she discusses the magazine or the Gazette, Emily is quick to point out how central education is to both. It is Emily’s own compulsive quest to get better with horses, especially her horse Belich, that has overflowed into her livelihood. 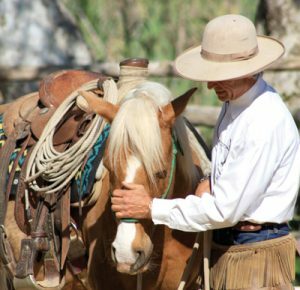 The result is a career based on sharing the best horsemanship guidance available with other horse lovers full-time. Each DVD runs between two and two and a half hours and includes multiple segments with a variety of horse folk. The segments provide a range of approaches to topics. In some, a guest horseman will work a horse and discuss the process with the viewer as it unfolds, sharing what he or she sees taking place, what he or she is doing, what challenges are presented by the horse, and how things turn out. 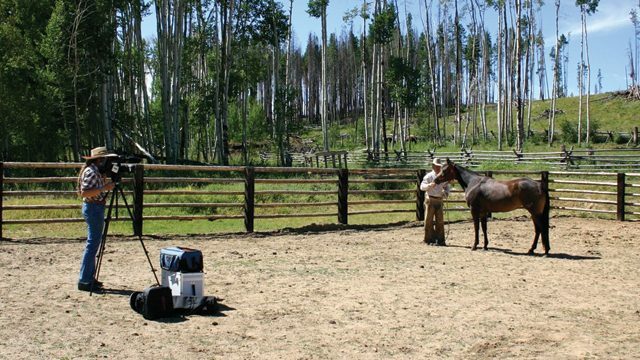 In others, a presenter works with a student and a horse so the viewer essentially gets to sit in on a lesson. 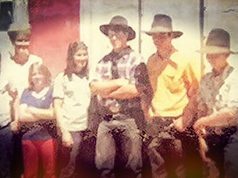 Others are interviews with capable horse people who speak on a range of topics from wrecks to their own approaches to some aspect of horse work. As mentioned above, the Gazette was designed to be a growing base of educational knowledge, and with 30 volumes now available and many upcoming segments already “in the can,” Emily’s special project is enjoying both longevity and increasing interest. For Emily, the chance to load up the truck with her equipment (and often her daughter, Sydney, as well) and travel to learn from so many great horse people who generously allow her to come and visit and put them in front of the camera is a unique circumstance that she is eager to share. 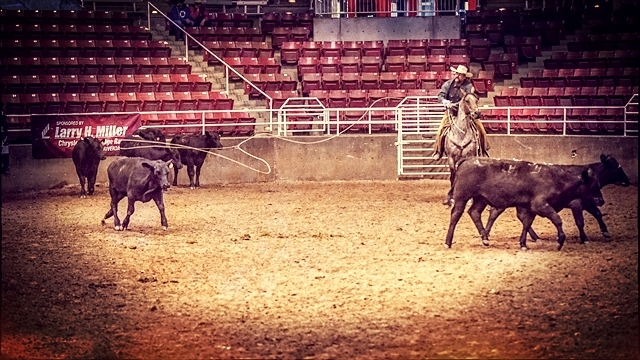 One recent contributor to The Horseman’s Gazette is Chris Sobenes. 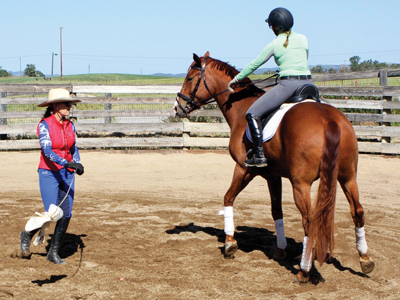 Chris is based in Oak View, California, and she trains horses and teaches horsemanship. (www.chrissobenes.com) Chris has a segment in Issue No. 28 of the Gazette that shows how to start a novice adult rider with good horsemanship concepts in a safe and fun way. 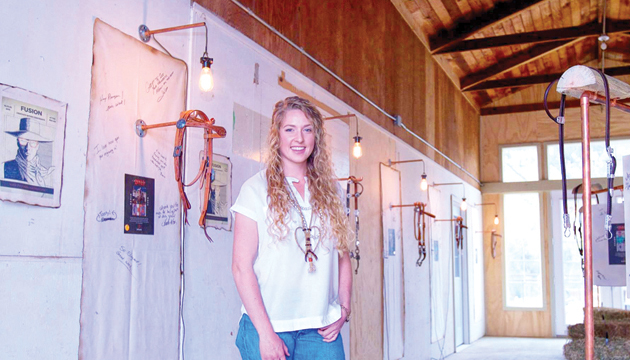 Emily believes that providing an opportunity to see a great variety of horse people share their knowledge in the video series is a great way to stir up ideas and to inspire people to improve their horsemanship. “Tom Dorrance encouraged people to go watch anyone that they possibly could because you can learn something from everybody by watching what they do,” Emily says. “How the information is conveyed in these videos is dependant upon the source that’s providing it. So, like Windy Murdoch, when she does a piece, she is typically teaching another student. So you’re getting to watch someone’s lesson and see her help that rider make changes and you can see the change in the horse and the rider. If it’s somebody like Martin Black or Peter Campbell or Buster McLaury, they’re with their horses and they’re demonstrating. “We’ve done quite a few segments with Bryan Neubert. He’s got lots of young horses to work with. When he is home in the winter or early spring, we’ll go to his place and film for a day or two and he’ll work all the horses that he would be working if he were there without us. He’ll bring the yearlings in and introduce them to being led. Or, we did one where it was the first time a colt was away from its mom. We did some segments on what he would expect with a really young horse with a few rides introducing a stop and a turnaround versus a horse with two or three years of riding working again on the stop or the turnaround so that you can see the progression and what he would expect at different moments from a horse with that similar experience level. It’s really a wide variety of content. Emily stays on the lookout for new contributors. The process of deciding if a new teacher or trainer is a good fit for the series requires time, effort, and consideration. Feedback from subscribers to both the magazine and the Gazette is appreciated. Like people suggesting possibilities for new horsemen to include, Emily considers all the opinions that come in. Perhaps the best way to wrap up an introduction to The Gazette is simply to share a quote from a longtime subscriber. 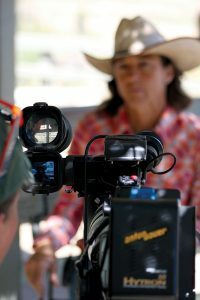 “I am so grateful that Eclectic Horseman magazine and the Gazette video series are available,” says Lisa Capaldini. 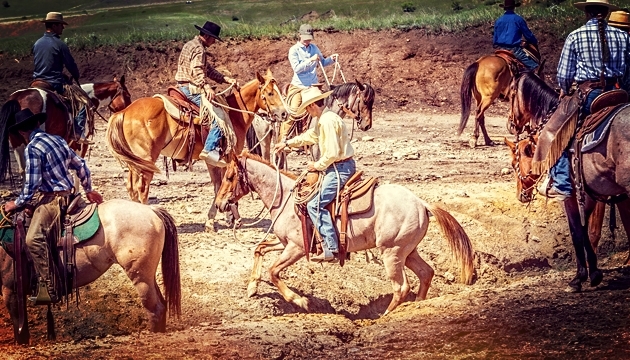 “I find that they both express a very specific philosophy of horsemanship that is pretty hard to find elsewhere, namely that riders have a responsibility to be good partners to their horses. Because horses are so connected to their emotions, good riding and horse work means ALWAYS taking the horse’s state of mind/heart in mind. Some ‘experts’ reduce this to minimizing reactivity/ensuring obedience but I think it’s way more complicated than that, and, requires the rider to be emotionally tuned in to themselves. Since I started riding 12 years ago I have been happily obsessed with horses and trying to improve my horsemanship (being with horses) and trying to improve the technical parts of my riding. 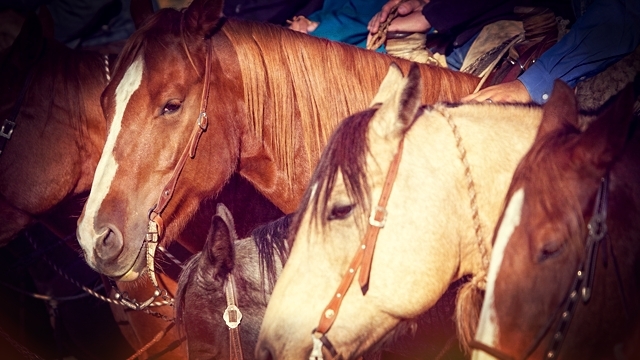 The Eclectic Horsemanship approach keeps those two linked. “Another feature I really appreciate is how humble the EH experts are—there’s a saying about doctors (I’m one!) that over time, every doctor becomes either cynical or humble (hopefully the latter) and I find myself remembering how humble your teachers are when I’m having a horse problem. And your experts also teach “beginner’s mind,” an approach that encourages patience and openness rather than quick solutions. 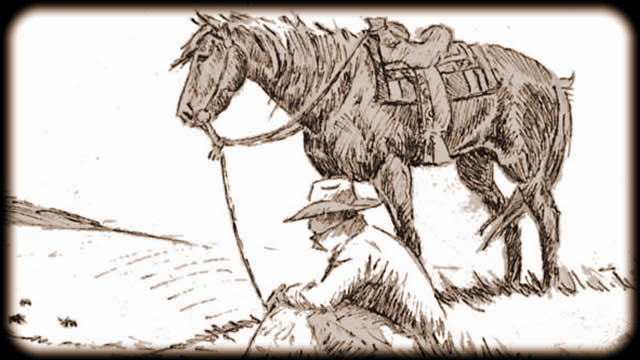 Watch short excerpts of all previous issues of The Horseman’s Gazette.